I awoke this morning with a throbbing headache, ringing in my ears, and complete exhaustion that consumed me. I did not have a hangover. Last night I took the girls to an amazing event. An event of such epic proportions that all Americans would call me their idol if they knew I was there. An event that makes young girls swoon and parents sway. An event so huge that even I thought it to be adventure-worthy. 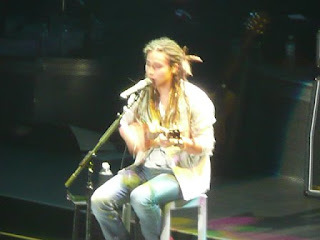 So we went . . .
. . . to the American Idol concert. Oh yes indeedy, the girls and I rocked out last night. But we did not scream (well, only in jest). We left the screaming to the four little girls who sat behind us. And to the two teenaged girls sitting in front of us. And to every other blessed person in the Allstate Arena last night who, this morning, have no vocal chords left. Oh my, I have never in my life experienced such cacophony! It started out kind of regular-rock-concert-like when Chikezi came out. See, nobody in the audience knew what to expect, but when they flashed a great big old #10!!!! up on the screen, we soon realized pretty quickly that they were going to build toward the final set and that we’d have to wait a while to see THE. AMERICAN. IDOL. 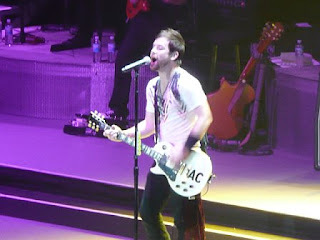 David Cook. So some people saved their screams. But not Little-Miss-Shrill behind me. For three hours this little . . . girl . . . screamed her lungs out. By the time the intermission came, I had an unexplainable headache. Sure the music was loud, but I just couldn’t figure out who, sitting behind me, was whistling the entire time. Or why. I kept hearing what I thought was someone putting their two pinkie fingers in their mouth and whistling that high-pitched way that I’ve never been able to do. But shortly after intermission, when Jason Castro came out (and I was tempted to scream, but I refrained), I looked behind me and saw that it was this little tiny thing making all that racket. She was no bigger than my Maggie, but boy did she have a set of lungs! So as the anticipation of seeing Mr. American Idol grew, so did the noise. Now, I must pause here and say that I know what you’re thinking. Geesh, she sounds crabby. She must sure be some old fuddy-duddy. First, let me say that I am not that old (girls, don’t laugh!). And second, I am no fuddy-duddy. I can rock out with the best of them. In fact, the last concert I went to was the U2 concert at the United Center when they came to Chicago a couple of years ago. It was loud, but I handled it just fine. U2 seems to have a little bit different audience base. One that doesn’t scream quite so much. So anyway, by the time David Arculetta came out on stage, I had just about lost it. Between screamer-girl behind me and the two teeny-boppers in front of me (who watched the entire show through the lenses of their cell phone cameras! Don’t even get me started!) I was quickly becoming unable to concentrate on the music or the performers. My own girls, sweet precious things that they are, sat quietly in their seats the whole time. Occasionally they would sway. One time one of them stood up. But for the most part they were quietly taking it all in. We laughed a lot and had a wonderful time together, but not a single scream came from our section of the arena. I really need to teach them some rock concert etiquette. 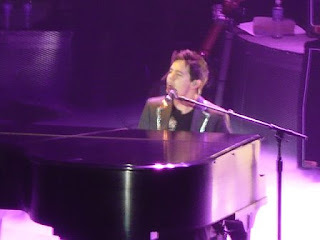 Edit: Thanks very much to my friend, Martha, who has a much better camera than I do and who shared her pictures with me! Concerts...a love-hate thing, especially the way you described.